In compliance with EU safety regulations, all new vehicles built are fitted with a Tyre Pressure Monitoring System (TPMS). This safety feature is fitted to the wheels of many modern cars and vans ensuring your tyres are properly inflated at all times. This reduces the risk of suffering a dangerous high speed blowout, as well as returning better performance and efficiency from your car. Keeping your tyres properly inflated is essential for your safety on the road: a TPMS uses a sensor to detect sudden or gradual changes in tyre pressure, alerting the driver of potentially performance-affecting pressure changes. 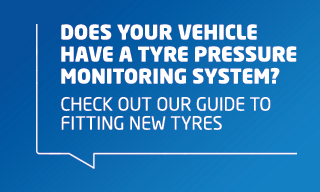 What does a tyre pressure monitoring system do? The Tyre Pressure Monitoring System (TPMS) is an automatic monitoring system designed to monitor the pressure of tyres for light vehicles. The system monitors tyre pressure and temperature at all times and alerts the driver if there are any problems in one or more tyres, allowing issues to be dealt with straight away to increase safety and other problems that can emerge due to under-inflation. There are two different types of TPMS - indirect and direct, which differ in a few ways; Some car marques have offered TPMS for many years but they typically use the 'indirect' TPMS system. This uses the car’s ABS system to approximate tyre pressures. Conversely, a direct TMPS gathers data straight from the tyre valve, giving a far more accurate reading. Direct TPMS is far more common among cars made after 2014. As of 2012, If your TPMS light is showing on the dashboard your car will automatically fail its MOT. This may be as simple to fix as ensuring that all the tyres are at their correct pressure, but it may also be as a result of a faulty sensor. Should your tyres need a new sensor, ATS Euromaster will supply replacement parts of at least manufacturer spec. You're safer –It isn’t always obvious that your tyres are losing pressure. But tyres that are driven underinflated are more likely to suffer a sudden tyre failure. TPMS alerts you almost straightaway of any pressure loss. It can save you money– The additional rolling resistance of an underinflated tyre means that your vehicle is less fuel efficient. In short, your engine will use more fuel, over time. And don’t forget, underinflated tyres are more likely to wear more quickly. It's greener – With higher tyre rolling resistances and lower fuel economy, the cost to the environment is also higher. Pollution from your car, extra fuel being burnt and the premature end of tyre life all have a damaging effect on the environment.